Provide the information you know, as well as what you would like us to learn in our research, by completing a research quote. When you are ready for the research to begin, make a payment through our payments page. Your project is assigned to a Senior Project Manager who oversees the successful ontime completion of your project and assignes the project one or more of our professional genealogists. 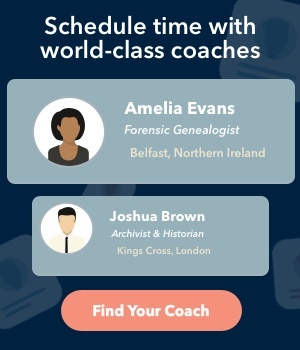 What makes Genealogists.com unique is that we have over 4,000 professional genealogists as well as hundreds of historians, private investigators, forensic scientists, DNA experts, university professors, scholars, and archivists. An entire army of researchers working worldwide to access and analyze the records that are not available throughout the world, of which over 90% are not online. Research Calendar. A detailed listing of all the places where we searched for records, whether a record was located or not. Documents or records. Either online or hardcopy digitzed versions of all records found. Research Report. You will receive a full and detailed report of the work that was completed, a calendar/log of all records searched, and digital copies of all of the documents that we located. You can see examples of research reports and logs. The report includes suggestions for the next steps you can take in your research. Recommendations. A list of next steps or suggestions for future research in order to help you learn even more about your ancestors. As soon as the researcher has completed the deliverables, Quality Control is performed to ensure that the objectives have been met and that the deliverables represent the quality that the world has learned to expect from the largest family history research firm in the world.